Get a great price on the SMOK G-Priv TS from Vapor DNA. 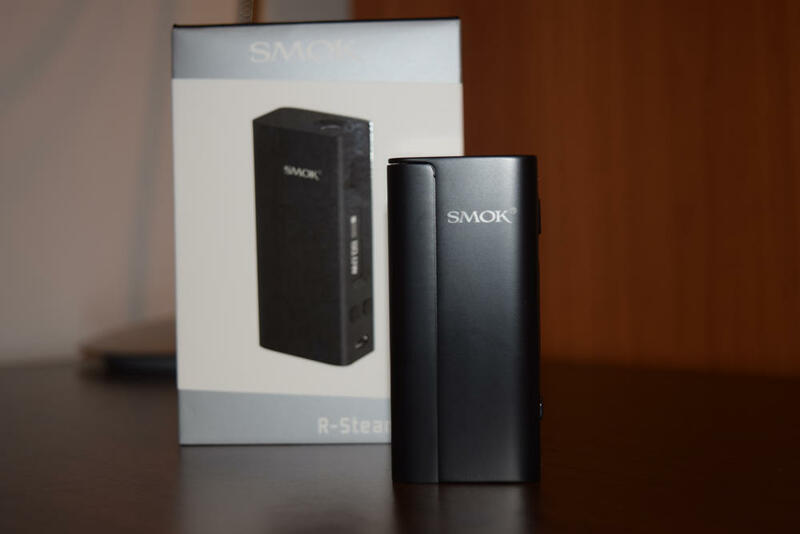 SMOK has been at the forefront of innovation in the vaping industry for a long time. 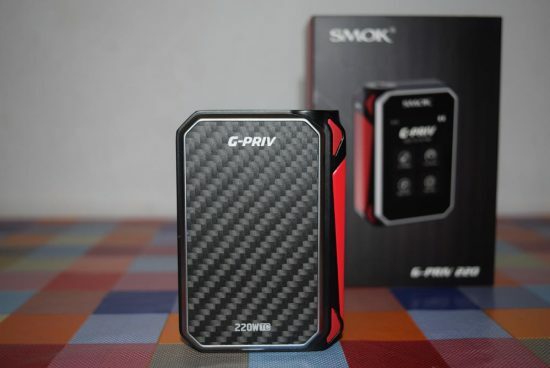 They were the first to introduce high-tech technologies like Bluetooth connectivity and wireless firmware updates to the vaping world, and with the new SMOK G-Priv 220W mod, they are taking things even further. While the G-Priv may not be the world’s first touchscreen mod – see the Siegelei T200 or the Laisimo L3 – it’s definitely the most powerful one right now, and I’d even venture to say that it’s also the most refined. 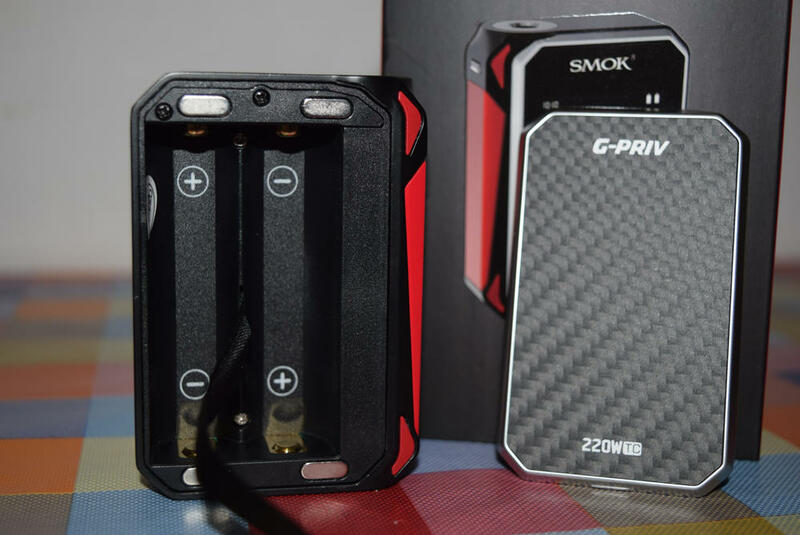 The G-Priv touchscreen mod comes in the standard SMOK packaging, a large cardboard box with and elegant hard paper holder featuring a glossy picture of the device on the front, and a bunch of useful information on the back – kit contents, mod specifications, a short description, as well as the standard warnings and legal disclaimer. If you’re worried about counterfeits, on the side of the box there is a scratch seal that reveals an authenticity code, which you can check online. 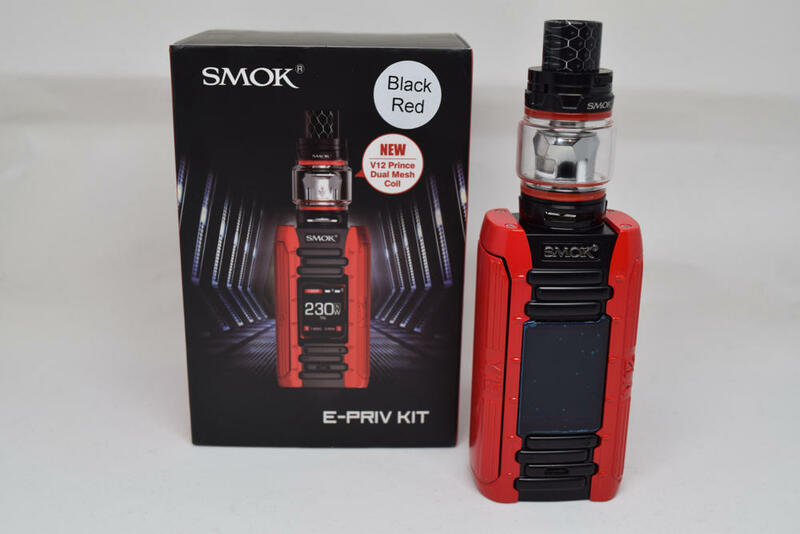 Inside the box, we have the SMOK G-Priv 220W sitting snug in a foam holder, and underneath that holder we have a micro-USB charging/update cable, a user manual, a warranty card and a small leaflet on battery safety. Now, mine also came with a black silicone sleeve for the mod, but it’s not mentioned in the contents list on the packaging, so I’m not one hundred percent sure that it will be included in the retail version. I hope it will, because it does a good job of protecting the device from day-to-day wear and tear. 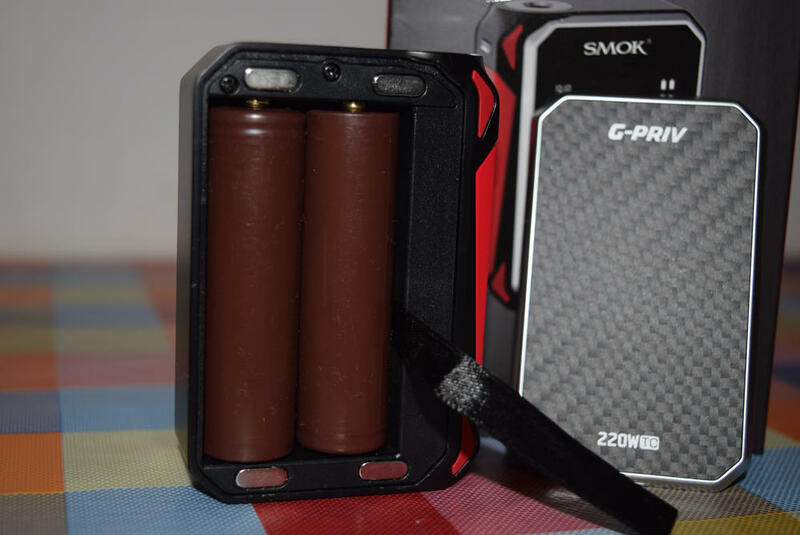 Measuring 85mm x 58.5mm x 28 mm, the SMOK G-Priv is an average-size dual-battery box mod, although I will say it is a bit on the thick side. It’s also relatively heavy for its size, weighing in at 202 grams by itself, and 292 grams with two 18650 batteries inserted. 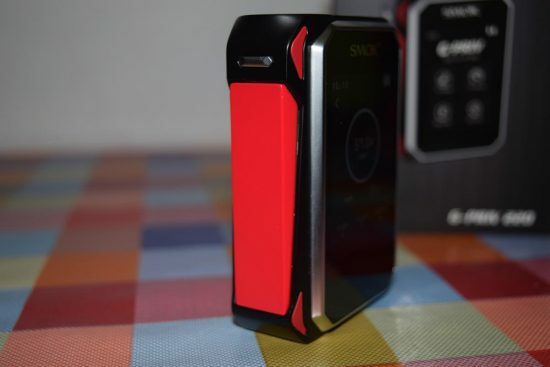 The body is made of primarily of zinc alloy, the material SMOK has been using on pretty much all their mods. The few exceptions are the touchscreen, which is made of shatter-resistant, shock-proof glass, and the battery cover, which the Chinese company claims is made of “carbon fiber material”. It definitely looks like carbon fiber, but it feels like light plastic to me. I tried peeling at the corners to see if it’s actually just a sticker with a carbon fiber motif, but nothing came off. Also, I will say that over the three weeks since I’ve been using the G-Priv, the battery cover has remained in pristine condition, while the zinc alloy body has quite a few scratches on it. So I guess it may actually be made of carbon fiber, which is pretty cool. Another great thing about the battery door is how firmly it attaches to the mod, thanks to eight big and very powerful magnets – four on the cover and four on the mod. It’s so firm, in fact, that you have to apply quite a bit of pressure to pry it off the device. To remove the battery cover, you have to insert your finger nail in a small notch on the base and pull outwards, and when I say pull, I mean PULL! It can be a little frustrating, especially if you just clipped your nails, but on the bright side, you never have to worry about the cover coming off the mod accidentally. There’s also no wobbling whatsoever. When you attach this thing, it just lock in place. 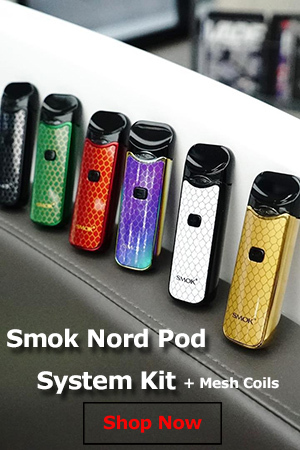 On top of the SMOK G-Priv we have a quality 510 connection with a brass, spring-loaded pin, while on the bottom, we have some battery vent holes, and a mini USB port for charging/updating the device. Normally, charging removable batteries in dual-battery mods is not recommended, and SMOK usually mentions that the port is meant for charging only, but not on the G-Priv. This one actually says “charge&update” right next to the port. It turns out that this particular dual-18650 mod features balanced charging technology that allows user to safely charge the batteries on board. That’s a big plus, especially for vapers who don’t have an external charger available. 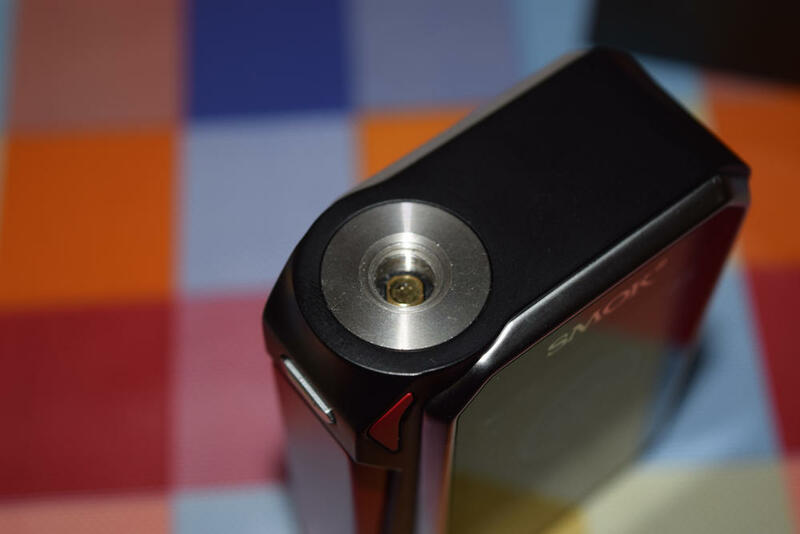 Most SMOK vaporizers feature a firing bar instead of the classic power button, and the G-Priv 220W is no different. I like firing bars in general, and I’m a big fan of some of SMOK’s, like the ones they used for the Alien 220W and the OSUB Plus 80W, but this one is definitely not my favorite. While the two firing bars I mentioned are very firm and make this nice clicky sound when you press them, the one on the G-Priv is a bit loose and makes a more hollow sound when pressed. Also, between the right side of the bar and the mod there’s this gap that’s big enough to see the back of the touchscreen and a bunch of electronic components. Now, if I can see inside, I’m pretty sure any leaking e-liquid could find its way through there. 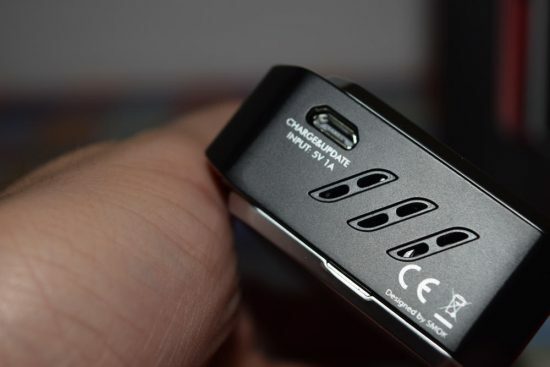 I know it sounds like nitpicking, and it is, to some extent, but these small details actually contribute quite a bit to the quality feel of a device, and I just think that in this case, the firing bar could be a bit better. That’s not to say that these small flaws affect the way the firing bar works. It’s very responsive and easy easy to press, so it basically works as intended. To turn on the device after inserting the batteries, you have to press the firing bar five times rapidly, and to lock the firing bar – and only the firing bar – press it three times in rapid succession. Repeat this second process to unlock the firing bar. To turn off the G-Priv, press the bar five times, and tap ‘yes’ on the touchscreen when the confirmation box appears. The SMOK G-Priv does away with physical wattage/temperature adjustment buttons, featuring instead virtual buttons usable via the touchscreen. However, you’ll notice a small button located right above the firing bar. This is the lock button, or the stealth button, whatever you want to call it, and it’s one of the most ingenious features of this device. It has two functions: to lock the touchscreen so you can use the device without worrying about accidentally changing the settings, and to turn off the display so you can vape in stealth mode. To lock the touchscreen, simply hold down the lock button for one second, until a small lock icon shows up on the display. You can now tap or slide your finger on the touchscreen and it won’t register your inputs. The firing bar will remain active. This is useful for those who want to use the G-Priv with the display on, without having to worry about accidentally changing the wattage or the temperature settings. After all, what good is a big, bright display, if you can’t look at it when you want to. To turn off the display, simply click the lock button shortly. Again, the firing bar will remain active, so you can vape the mod in stealth mode, and not worry about accidentally changing the settings via the touchscreen. This option also has the advantage of saving battery life. Whichever option you opt for, using the lock button is extremely important when using the SMOK G-Priv 220W. The touchscreen is a very cool, impressive-looking feature, but if you forget to lock it or turn it off, you will inevitably be frustrated with it. Because of how responsive it is, you will unknowingly change the wattage or temperature setting, and that can actually be dangerous. I was lucky, as when I first forgot to lock the screen, I unwittingly dialed down the power output from 60W to 1W. But what if I had cranked it up to 220W? That actually happened to Big Lou during his video review of the G-Priv, and the cotton in his RDA literally caught fire. You want to be inhaling vapor, not flames, and there’s also the issue of stressing the batteries unnecessarily. So please, be careful to ALWAYS lock or turn off the display when vaping. 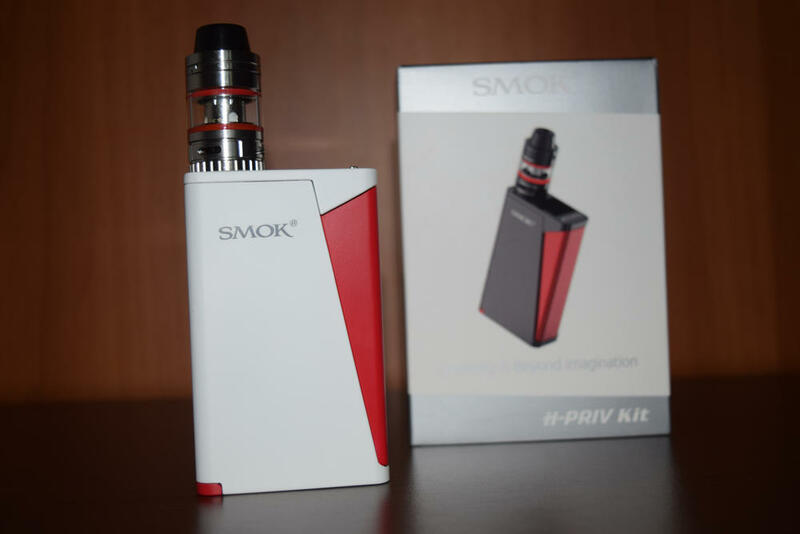 The main draw of the SMOK G-Priv 220W is definitely its 2.4″ touchscreen. If you’re expecting the resolution and color saturation of flagship smartphones like the iPhone & or Samsung Galaxy S7, you’re going to be disappointed, but otherwise, the touchscreen of the G-Priv is a pleasant surprise. It is fairly large and bright enough to see even in direct sunlight, although I would have liked to see a brightness adjustment option, which was actually available on pretty much every other SMOK advanced mod I’ve tried so far. But the thing that I find most impressive about it is how responsive it is to both taps and swipes. The protective glass feels solid, and the Chinese company claims it has been tested by dropping 64g steel balls on it 10,000 times. I can report that after about three weeks, it doesn’t have so much a small scratch on it. It may not be Gorilla Glass, but it’s no joke either. In terms of available options, the menu of the G-Priv is very similar to other SMOK mods, but because of the touchscreen, the layout and navigation are completely different. The home page is very well thought out, with the current wattage/temperature taking up the center of the display. This large, circular indicator also acts as a puff timer. In the top right corner we have two battery indicators – one for each individual battery – while on the left side we have a digital clock. In the lower part of the display we have a puff counter, and three real-time indicators for: amperage, voltage and atomizer resistance. To go into the actual menu of the G-Priv, you have to tap the small “back” arrow located on the left side of the display, right under the digital clock. Here, you can select from four sub-menus: VW Mode, TC Mode, Max Puff and Settings. In wattage mode, you can select a vaping effect – which are basically preheat options – from the usual Min., Soft, Normal, Hard and Max., adjust the wattage via either a virtual slider, or two ‘-‘ and ‘+’ buttons. There’s also an “Activate” button, for switching from TC mode. 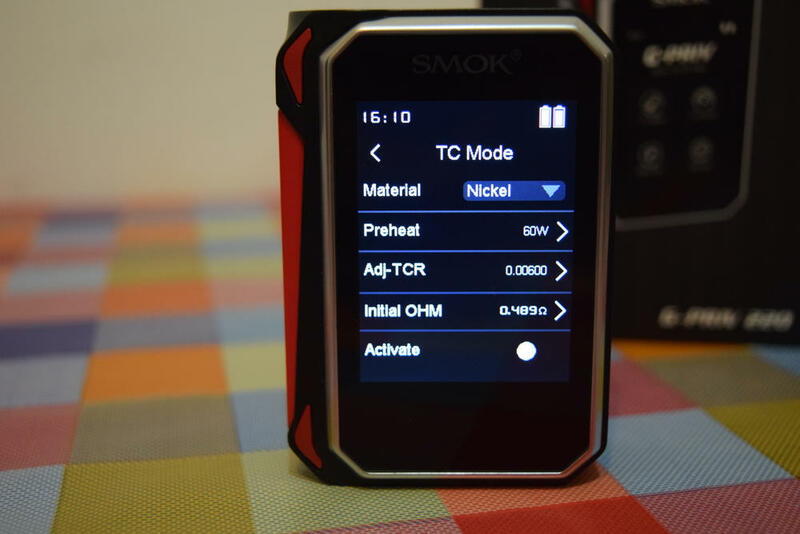 In temperature control mode, you can select the coil material from Nickel, Titanium and Stainless, via a drop-down menu, adjust the preheat wattage, adjust the TCR for whatever coil material you are using, adjust the initial resistance of the atomizer, and activate temperature control when you’re in wattage mode. In Max Puff, you can set a maximum number of daily puffs – once you reach it, the device won’t fire anymore – or reset the puff counter. In the Settings sub-menu, you can set the screen timeout, set the time and date, and reset the SMOK G-Priv to factory settings. This section also displays the UUID, and the firmware version. The menu is very easy to navigate, but you’ll probably only go into it when switching from one vaping mode to another. To make adjustments to the current wattage or temperature, all you need to do is tap on either side of the wattage/temp indicator on the home screen, and two arrows will pop up on the screen. Press the left one to turn down your wattage/temperature, and the right one to crank it up. Just make sure to lock the touchscreen when you’re done. I had no trouble using the touchscreen menu, in fact, it was a breath of fresh air, but there are a few things that could use some improvements. For starters, the drop-down menus for coil material and preheat selection are too small. I have small fingers so I wasn’t too bothered about it, but someone with bigger hands will definitely struggle to input these options, and sadly, there’s no other way to do it than trying to tap on the tiny options. Then there’s the scrolling speed in wattage mode. Up to 100W, you can adjust the wattage in 0.1W increments at a decent speed, but from 100W to 220W, you can only do it in 1W increments, and keeping the right-arrow pressed makes the counter simply jump from 100W to 220W in like two seconds or so. It’s way too fast, so to set a certain wattage within this range, you have to slowly tap the arrow, to make sure you don’t jump too much. It’s not a huge deal, but I hope SMOK addresses this issue in a future firmware update. I don’t like to make battery life estimations on variable wattage/temp. control devices, especially ones with removable batteries. There are just too many variables to consider, so making even a slightly accurate prediction is virtually impossible. But I did want to touch down on this topic because of the touchscreen. Keeping the touchscreen active while vaping definitely takes a toll on battery life, when compared to vaping in stealth mode. There’s not a huge difference, but it’s noticeable – in my test, I got about an hour less vaping time when keeping the touchscreen on. Of course, I couldn’t replicate my exact vaping habit on two separate occasions, so I can’t say for sure that the reduced battery life was due solely to the touchscreen being on for longer, but it definitely contributed. As for the actual performance of the SMOK G-Priv 220W, I can honestly say that this is one of the best SMOK mods I have ever used. I’m going to start with the thing that surprised me the most, the complete lack of delay when pressing the firing bar. 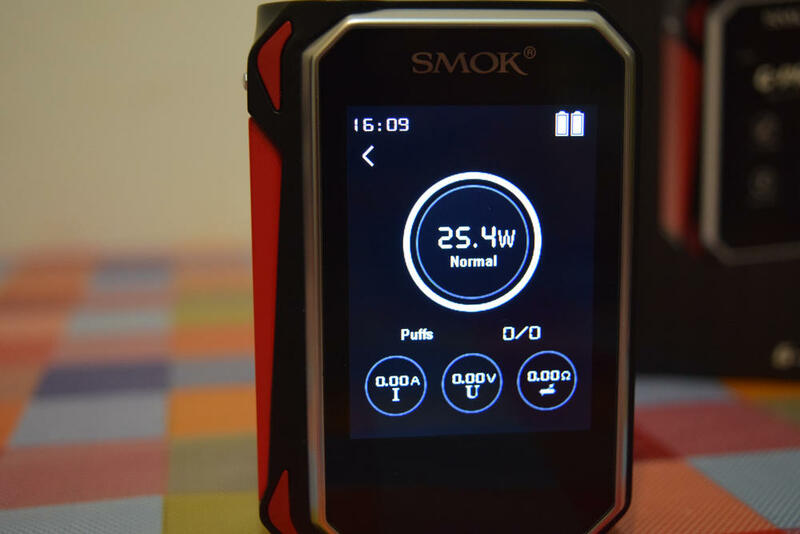 The Chinese company has taken a lot of flack for the firing delay on some of its previous mods, like the SMOK X Cube 2, and the X Cube Mini, but it’s come a long way since then. The Alien 220W mod, my favorite device right now, was also incredibly responsive, but the G-Priv is even better in this regard. Just press the firing bar and you can instantly hear the juice sizzling. I haven’t been using the G-Priv in temperature control all that much, but I did test it with a dual stainless steel build (Ω0.25), and it handled it perfectly. I never had it jump out of temp control, like the SMOK R-Steam, for example, and it seemed to temp-protect very accurately. With dome devices I sometimes feel that they temp-protect too soon, resulting in a weak, overly cool vape, but I didn’t have such problems with the G-Priv. As I said, I didn’t use the temp-control feature too much, so if you’re interested in more details and technical data, I suggest checking out DJLsb’s review. He has a great deal of info on temp control. In wattage mode, the device performed perfectly. As I mentioned, the firing bar was very responsive, and I’ve had no misfires in the three weeks of constant use. The SMOK G-Priv is a cool-looking touchscreen device, so if you want something to show off to your friends, it’s a very good option. But there’s honestly more to it than that. It’s a very solid mod that actually performs flawlessly. There’s no firing delay whatsoever, the temperature control feature does a very good job of preventing cotton burning, and the high-power output allows you to use the fanciest coil builds. 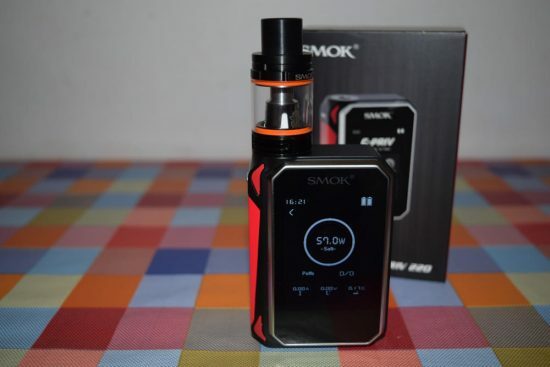 There are some small details SMOK could have handled better, like the feel of the firing bar and the wattage scrolling speed, but nothing major. Overall, I thing the G-Priv is one of the best high-power mods available on the market today. I love it! I totally agree. The time thing and the battery indicator not showing percentage. Otherwise it’s the best mod I’ve owned to date. You can see percentage when it’s plugged in so there’s no reason they can’t address this in a future update. However, most users of this device are going to be removing their batteries to charge externally so this is useless right now! Come on, guys. Military time is the easiest thing in the world to learn. I agree that Smok should have included the option for both 12 hour clock and military time. That being said, the unwillingness of all you naysayers to learn something extremely simple disturbs me. Expand your attention span for God’s sake. The G-Priv is the most wonderfully responsive and simply beautiful mod I’ve owned to date, except for the fact that my fire button squeaks unless I press it on the very top. Otherwise, no complaints. 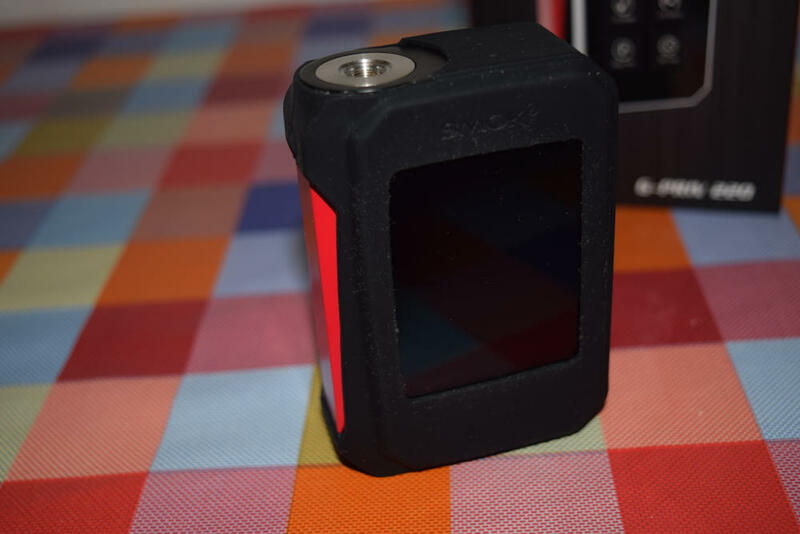 I would like the G-priv to be Bluetooth like the Xcube and yes I would like it to have the battery prosentage also and the time could be change able that would be nice but all in all I like it.. Just a few things can be fix. Maybe with an update. The Smok G-priv is the best mod I have ever had. The lock button can get too touchy over time of use to the point that tapping the whole mod or using the fire button can lock/unlock the screen. You must lock after adjustment or you’ll for sure mess with the wattage as its very sensitive. Also mine is ver.1.6 and that’s good but this mod cannot be updated. I’ve plugged it into my computer and the computer will not recognize it as an external device.. This is a big let down being all reviews have stated otherwise. And as others have mentioned the 24 hour clock is annoying. The only other things I wish this mod had was Ramp up ability in wattage mode. The fire button for me is fine except as I’m firing it will stop delivering if a slight amount of pressure is lifted so I basically have to apply alot more pressure to it as opposed to other mods with small fire buttons. 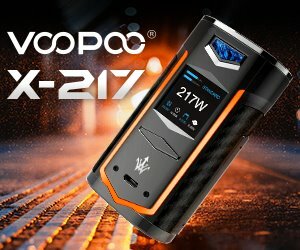 They released a firmware upgrade to 1.7 you can get it from the SMOK website. Hi guys, I bated a while to get my pc to recognise my device untill I figured out how, remove batteries, plug usb cable into device, then before plugging into pc hold fire bar down, while holding fire bar down plug usb into pc and you will hear the sound your pc makes when a new device is plugged in, keep holding it, now search for device on upgrade tool program, once device found click connect, open the file 1.8 and click update….I just kept holding the fire bar through the whole process, program might say not responding but be patient, it will soon say update succesfull….now uodate is done. Only change is that the correct day is now displaying with the date. After update just go into date settings, change to 2016, back to 2017 and exit. The correct day is now showing. Hope this helps…. I changed the time and date for my GPRIV and the day of the week is wrong how to I fix this is shows it being a Friday and it is a Saturday is there a setting for day of the week ? My g-priv mod is showing the wrong day to!!!! No, they are not included, so you have to buy them separately. Is the g priv good for big clouds o r should i go for the alien 220w kit. Or s there anything better? This Mod is great. But unfortunately they missed to implement Features which even the Alien has. PCB Temperature is not available, the puff counter resets every day and also the display of voltage and current resets to zero after a few seconds. If this once would be added or fixed, it would be worth 5stars for me.